I recently had an opportunity to have dinner and drinks at Kanki Restaurant in Durham, and the meal was one of the best I've had in quite some time. Please note that while I was hosted by Kanki, my personal thoughts about the dining experience are what I've shared here with you. 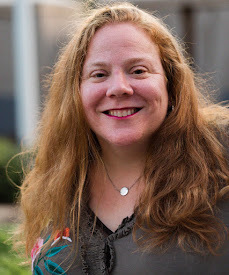 I was invited to come on out and bring a friend, and so my friend Kate of Life of a Ginger and I spent several hours enjoying appetizers, drinks, dinner and a wonderful Hibachi chef (Shout out to Ricky!) perform for us as he diced and chopped and lit our veggies aflame! The meal itself was delicious. 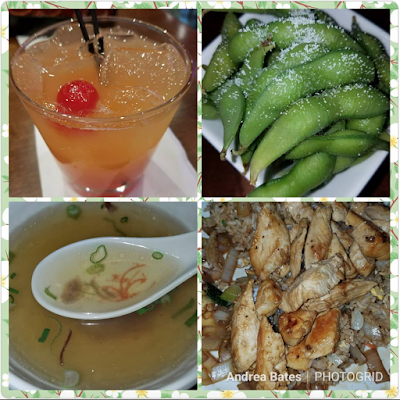 We had our appetizers and drinks in the bar area, before heading to the Hibachi table (as shown above^). 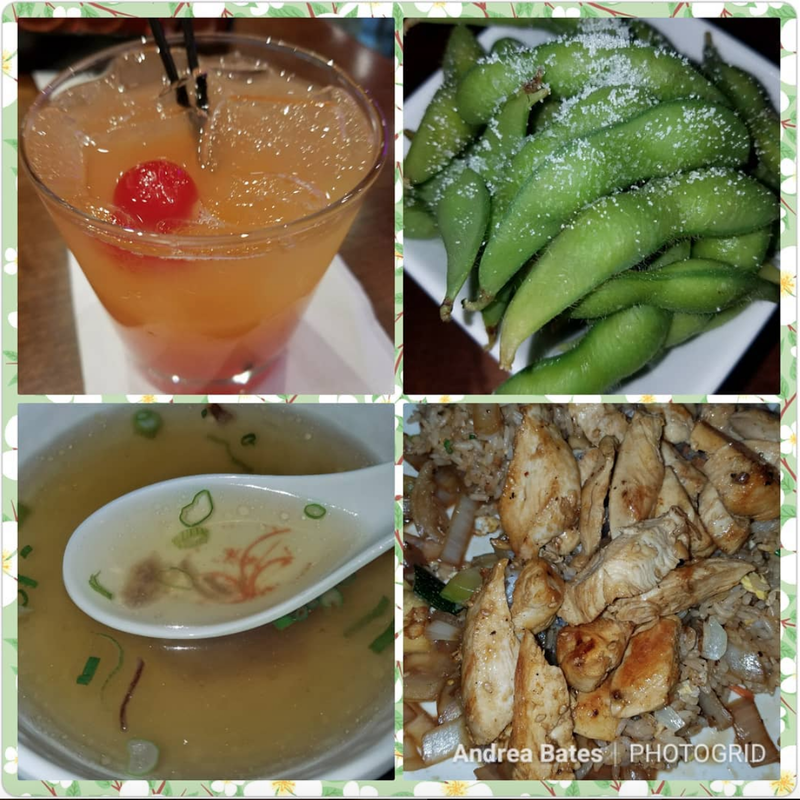 I had edamame - which is always a favorite. I also enjoyed one of their specialty drinks, while Kate tried sake for the first time with a fruit infused sake flight sampler. And I will admit that I had never tried flavored sake before and this may very well have changed my opinion of sake for good. And I love the variety on Kanki's seasonal menu. 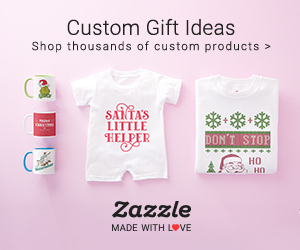 I didn't see it before I ordered my appetizer and drink, or those flash friend Brussels sprouts and Godiva martini might have been the way to go for me. 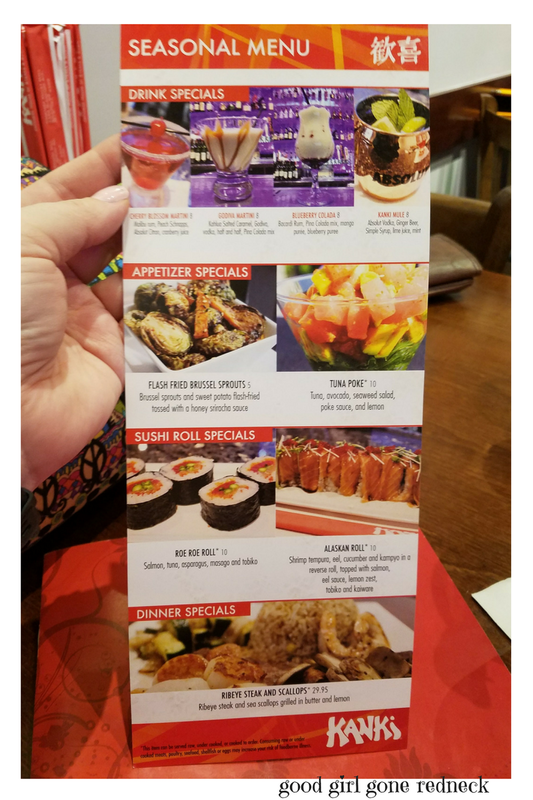 I have learned that they've recently updated their seasonal menu - and are now offering amazing dishes like Korean Fried Chicken and Black Tiger Shrimp. I am pretty sure that I would try the chicken and that Kate would get the shrimp, but which one would you choose? 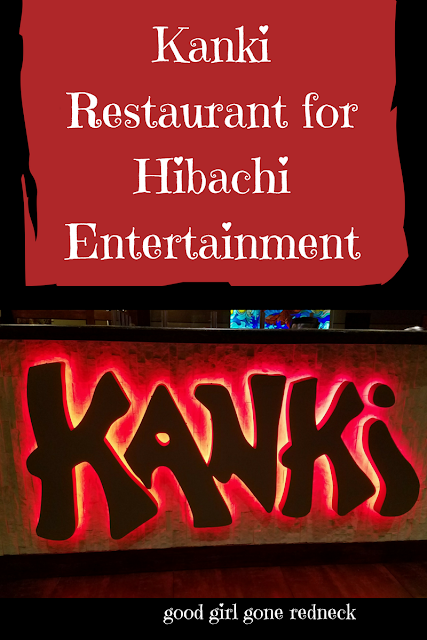 The staff at Kanki were welcoming and friendly, and, of course, entertaining. And the meal itself was one I won't soon forget. I've been already missing the Hibachi chicken and rice. Along with this wonderful meal, the Kanki team has given me something for my local friends. 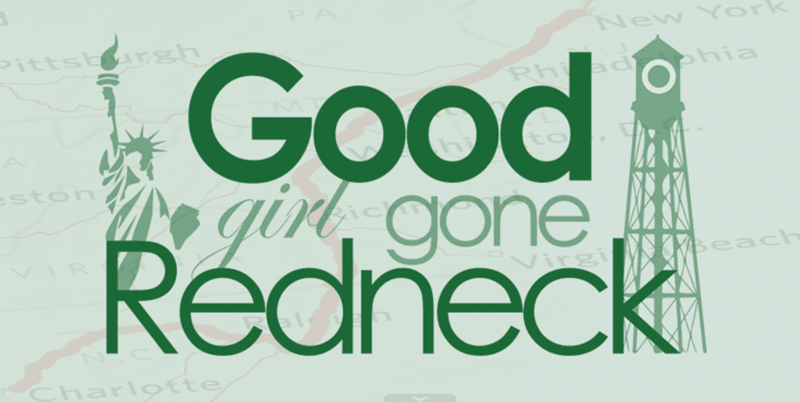 Use coupon code GOODGIRLGONEREDNECK to receive a free appetizer with purchase of an entrée. 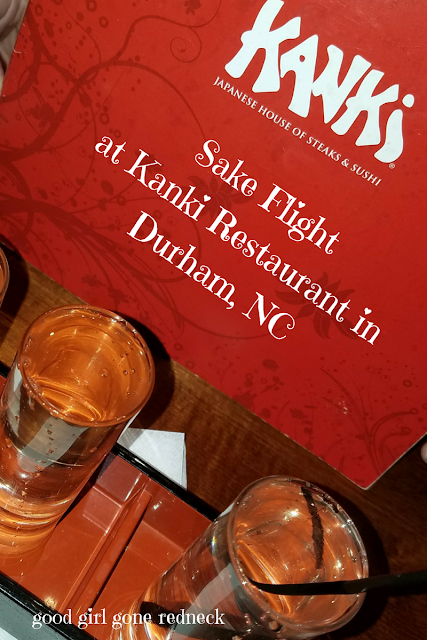 Want to find out more about what's offered at Kanki in Durham? My friend Tiffany of TheMrsTee has information about Kanki's business lunch over at her place. 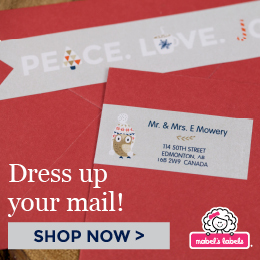 Stop by and tell her I sent you. As indicated, this dinner was hosted by Kanki Restaurant. All expressed opinions are my own.